W. W. Norton & Company, 9780393048209, 327pp. 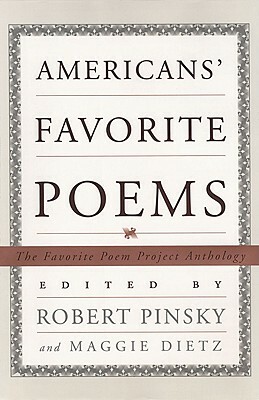 The selections in this anthology were chosen form the personal letters of thousands of Americans who responded to Robert Pinsky's invitation to write to him about their favorite poems. Some poems are memories treasured in the mind since childhood; some crystallize the passion of love or recall the trail of loss and sorrow. The poems and poets in this anthology--from Sappho to Lorca, from Shakespeare and Chaucer to Gwendolyn Brooks, Louise Bluck, and Allen Ginsberg--are poems to be read aloud and memorized, poems to be celebrated as part of our nation's cultural inheritance. Accompanying the poems are comments by people who speak not as professional critics but as passionate readers of various ages, professions and regions. This anthology, in a manner unlike any other, discloses the rich and vigorous presence of poetry in American life at the millennium and provides a portrait of the United States through the lens of poetry.